3. You need priority support. Credit where credit's due; Duncan came up with the name. "Ullapool Broadband" left out Little Lochbroom and Coigach, "Lochbrooms Broadband" left out Coigach, "Wester Ross Broadband" implied we would ignore Elphin so "Highland Community Broadband" it is; thank you Duncan. We plan to a run a wireless network which will broadcast from a number of small masts located across the area to individual receivers on each building. 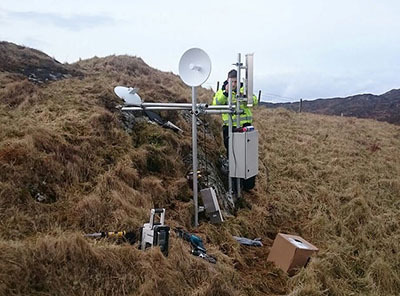 We are using equipment from Ubiquiti https://www.ubnt.com/ which has become the de facto standard for Wireless Community Broadband networks in Scotland and is tried and tested. Our plan is to run a pilot project in Ullapool and once we have tested network capacity, reliability and kit we will start to accept orders in Ullapool. We will then extend to Lochbroom, Little Lochbroom, Coigach and Gruinard Bay. It will take more time to connect those on the far edges but we will get to you as soon as we can. Who else has installed Community Broadband? Yes. But these will be less than 1m high and below the skyline. Below is a picture of one of SkyeNet's transmitters this an accurate representation of what our transmitters will look like and their scale. No. If you wish to keep your phone number in the same way you can move your mobile phone between providers you can keep and port your phone number to a company like Vonage (from £11pm) and do away with BT. The only downside is that your phone won't work during a power cut (unless you have a generator!). That depends on who you ask but OFCOM and the European Commission (as do we!) define it as 30Mpbs+. If you want to delve deeper into this please see this article. Yes, the more the merrier. Just let us know when you register how you would like to help (installation, administration, community representative etc.) and we will deputise you as soon as we can! Why are you a Community Interest Company (CIC) and not a Community Benefit Society (CBS)? We wanted to be a CBS rather than CIC, the main difference being that a CBS must distribute excess income whereas a CIC can make a profit but is not allowed to distribute the profits to shareholders only community organisations, but the cost of setting up a CBS was £1000 whereas as CIC is £35. We thought that was a better use of scarce money. We hope to convert to a CBS when finances allow. Can I invest in HCB? We always believed that HCB is a true community project with funding only coming from within the community it serves. Your subscription means that not only you but all your neighbours (should they wish) will be able to receive superfast broadband. The idea was never to provide a method for people to invest and receive anything more than a broadband service of, by and for us. However should an area want to raise the money to sponsor a transmission station we would give that area priority. We need to raise £75,000. This will allow us to build our wireless backbone network and connect the first 300 premises. Subsequent cashflow will allow us to continue to expand. For this amount to be raised we need 220 low users or 190 standard tariff users to subscribe. We need 190 residential subscribers to cover our core costs, 300 residential subscribers to cover our operating costs and 500 to fund network investment and further expansion if adjoining communities express an interest. Why aren't you fundraising by Kickstarter, Indiegogo, Just Giving, Virgin Giving and so on? We started off, and until quite late on, thinking we would use Indiegogo but we always had a feeling that it wasn't really right for us as we wanted this to be wholly community financed and we didn't have anything to offer outside investors e.g. Interest. As time has gone on we also realise that we would be charged 5% (at the very least) or the equivalent of two transmitter stations and we didn't see why all of us should give money away to an outside agency. Hence we are using PayPal (who will accept cards, debits and bank transfers) who only charge 3.4% on credit card payments. What happens if you don't raise the £75,000? If we don't raise the £75,000 we will return all the money raised. We will then go back to Community Broadband Scotland and try to raise the money from them although this would mean that we would only supply a service to Southern Lochbroom, Little Lochbroom and Coigach and our build out schedule would be delayed by at least year. How or when do I become a shareholder? You automatically become a shareholder when we activate your service. Each subscriber has one share. These are not transferrable or sellable and are relinquished when you give up your service. There will be an AGM which will allow shareholders to attend and speak. After we have been trading for a year and have a positive cumulative cashflow we will look at pricing again against ongoing investment and upgrades. Not in the foreseeable future. The installation and service prices do include VAT. What about the possible six month delay between the money and receiving the service? We realised that asking £340 or £400 is a lot out of a household budget especially while we are still paying for either ADSL or Satellite. For those who feel that is too much we have a £100 priority installation to reserve your space on the priority installation list and show your support. If you wait until the network is built to subscribe, and therefore we don't raise the £75,000 it is unlikely that we will have community broadband. What technical support will you provide? When we do install your service we will spend time with you (if you wish) making sure that all your equipment is now connected and working properly. If there's a problem at a later date we would ask you to follow the resetting instructions in your Welcome Pack. If that does not work you can ring our office where we will be able to see if the fault is with our network which we can see as far as your router. If we still can't help we will either have one of our volunteers pop round to see you, or if it's more serious, one of our contractors to replace the (consumer premises equipment) CPE. My house has been struck by lightning (again)! As our equipment is not using miles of copper wire it is much less likely to get hit by lightning in the first place. In the unlikely event your CPE is damaged by a lighting strike please let us know as soon as possible and we will come and replace it free of charge. What will happen to my email address if I subscribe to you? If it's a free email address you received when you signed up with a Broadband Provider please visit this link which should explain everything. If it's a free service (e.g. @gmail, @hotmail, @outlook etc.) or a specific address that you bought (e.g. @yourname.com) you should experience no change but we will check this when we install your service. I work from home, what tariff should I choose? We would consider you a standard residential user which also covers home business. It's only if you have a shop or separate premises that you trade from that we would classify you as a business. Will I experience buffering / loading issues while watching TV online? There should be no buffering while watching TV. In fact you should be able to run more than one stream at a time easily. That's no problem. You can still become a Founder Subscriber and enjoy priority installation, 14 months service for the price of 12 and help us build the network and we will delay your activation date until you are ready. Try as we might we can't anticipate all the questions so if you have one, drop a line to info@hcbroadband.co.uk and we will reply and add it to the FAQ list.